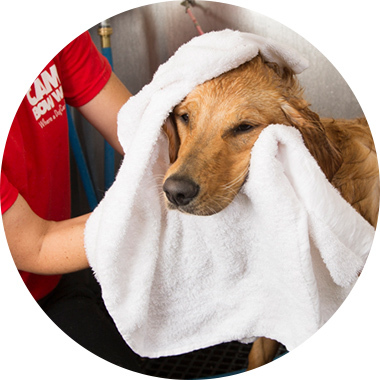 Contact us at (704) 260-0055 to learn more about our dog grooming services. Includes: scented shampoo, oatmeal conditioner, blow dry, brush out & cologne! Includes: bath with deshedding shampoo and conditioner, as well as an all-over brushing with a Furminator tool. This premium combination helps protect against excessive shedding and will leave your dog's coat looking healthy and shiny. Pricing is based on dog weight. Recommend Frequency: monthly or seasonally as needed. Our gentle, tear-free scrub helps to remove dirt, build up and tear stains while soothing your dog's skin. This cleanser contains natural ingredients like oatmeal, vanilla and blueberries that will leave their face soft and smelling sweet. Blueberry facials must be added to a bath service. Recommended Frequency: monthly. Nail trim plus a nail grind to help smooth rough edges and prevent scratching. Recommended Frequency: monthly. Our enzymatic toothpaste is specially formulated for pets, to help control plaque and fight bad breath. Recommend Frequency: biweekly. Trimming of your pup's nails to the shortest, yet safest length. Recommended Frequency: monthly. Our alcohol-free, antimicrobial cleaner breaks through tough wax and debris while deodorizing the ear. This solution contains gentle Aloe Vera and chamomile extracts. Recommended Frequency: biweekly.